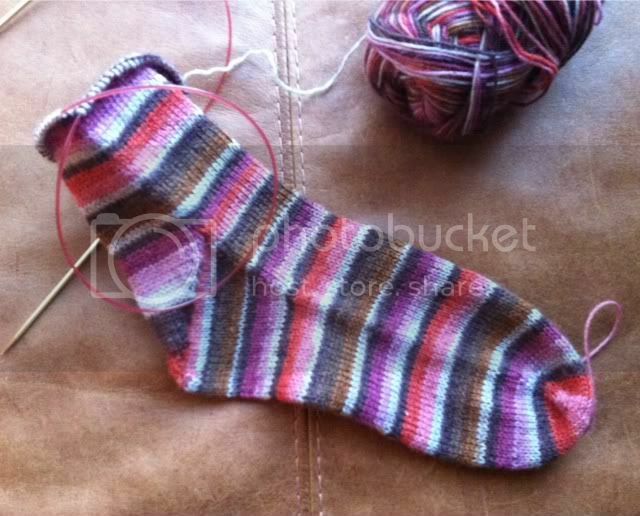 A wonderful weekend, (almost) a sock, and another finished YoP item! To celebrate D's 40th birthday, I conspired to plan a surprise overnight trip to South Lodge Hotel. I hadn't left Little Miss overnight before, but on Friday mum made the 4 hour drive from Wales to stay here with the children so that we could head off ALONE yesterday morning. 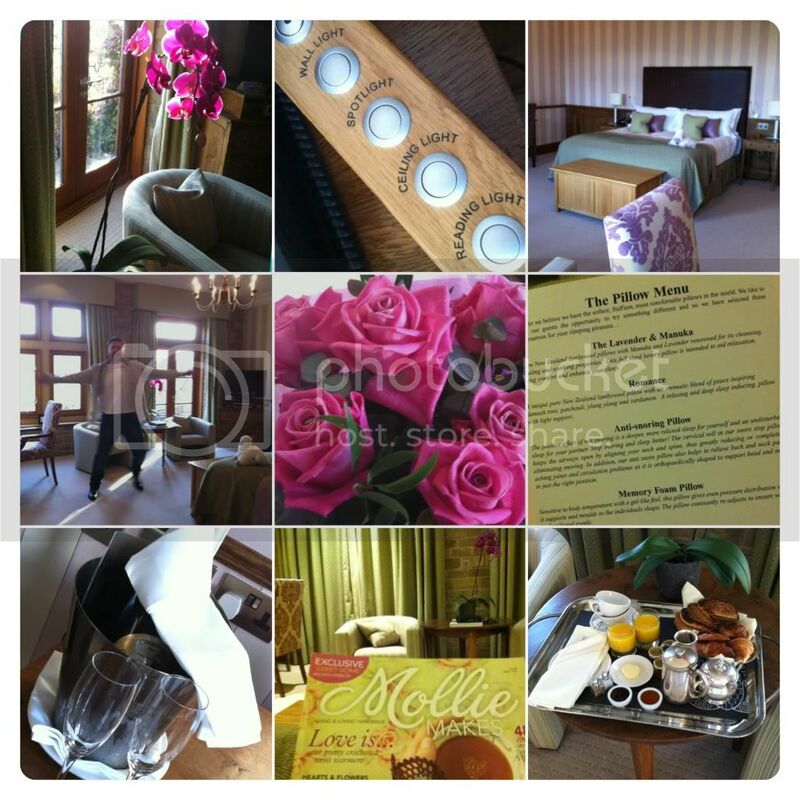 We have been very fortunate to have stayed in some luxurious hotels over the last decade - something we did regularly before we had children - and were not disappointed. The room - a Junior Suite called Nymans after a famous local garden - was spacious, beautifully decorated (the colour scheme even matched the issue of Mollie Makes that arrived just before we left!) and had an enormous bathroom complete with a shower big enough for a party and a bathside TV. We also had our own garden area, but it was too cold to do more than look out at it. Anyway, I can't believe I waited so long to make a sock - it's been easy! This week I've managed to knit whilst walking, so several inches were completed on the way up to the school. This attracted a little attention and a few questions and comments - mostly positive (I think!) not that this bothers me. Having tied my daughter onto my back rather than using a buggy over the last 32 months, I have become immune/accustomed to a few odd looks, and now there are loads of other people 'babywearing' in our village, so who knows - maybe knitting in public will catch on too. Had the weekend of spousal-confinement not gone so harmoniously, I'd have finished this one already. Now it'll be complete during (the final!) Sherlock tonight, and I'll get cracking on the second straightaway as I have the next sock yarn awaiting transformation. But the sock isn't my only YoP progress this week. While everyone else was in bed on Friday night, I stayed up and practiced speed knitting to make a neckwarmer for My Boy - he struggles to manage a long scarf when he's at school and has no help getting dressed, and it's turned cold. It's actually a bit tight when going over his head, but once he'd tried it he wanted it right away without me making it bigger. If I were making another, I'd add another 10 stitches/one more cable. In fact, I may have to surreptitiously replace it. I'm so pleased that I sat up until the early hours making it, because it was -6C when we went out yesterday morning at 9am, which may not seem that cold to some of you, but considering it's been mild enough to go out without a coat recently, it felt really chilly. So that's it! Back to normality, kid's bedtimes and a night on the sofa. I'll be catching up with the other YoP posts tomorrow, when those across all the timezones have posted. So glad you had a lovely weekend. The Hotel looks amazing. It's always so important to remember your a couple as well as parents. Your sock is absolutely fantastic!!! It's just bloody brilliant. I will send you a link for a great stretchy cast off. Great progress on the sock and I'll be checking out that book for my kindle, thanks for the heads up. Love the neck warmer and just perfect for little ones. Thank you, Ruth. Please note the edited note on the post - the Kindle link by Amazon is actually incorrect. Hooray for romantic weekends away. God on you for arranging it. Wowee that hotel looks lovely, I've just made sure that my hubby knows what he is failing to get right in our marriage!! The sock looks good, and knitting while you walk is very impressive, I know I'd fall over, I see that your obviously looking at your feet and not your knitting, but I'd still end up on my bum I reckon. The sock is great. I've added that book to my wishlist. I'm about 1/4 way through my second sock. I haven't had much time to work on it over the weekend, but I'm going to be doing some whilst watching Sherlock too. What did you think of Sherlock???? I felt the ending was a bit disappointing to be honest. How on earth?!? We thought he'd jumped in that laundry/rubbish truck and throw JM's body over in his coat, but the face was definitely SH and I don't see how he could possibly have survived that! I lost interest in the last episode about 3/4 of the way through, I couldn't say whether it was because I was more interested in my knitting or because it was too hard to follow, or because it just wasn't interesting enough to keep my attention but I lost track of what was going on. I saw the end and like you I thought it was a bit disappointing, I don't like endings that aren't explained, it bugs me. Wow. I struggle to knit sitting down sometimes, I know I'd come to grief if I tried it walking too. I absolutely love those socks - so pretty! - and the neckwarmer too. Small Girl is asking for a pink sparkly scarf, but I think she'd be safer (and warmer) with a loop. Your night away sounds wonderful. Gotta love a great hotel! I definitely think that a loop is the way forward for littlies. I am going to make one for Little Miss. Might make it to match her One Day Beret so it'll be a plain one in stocking stitch as the yarn is very colourful! 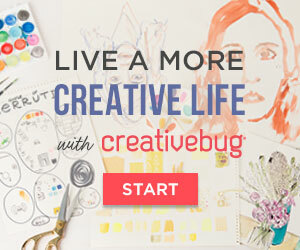 Thanks - I will do! He managed it fine this morning, so fingers crossed it'll last him a little while. 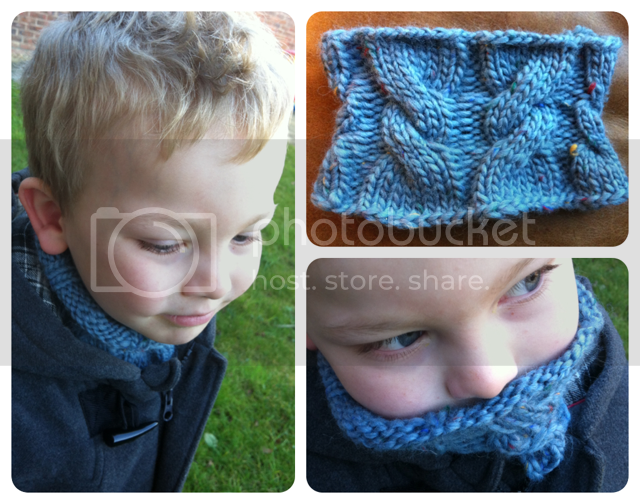 What a perfect cowl for your son; he is gorgeous! Scarves can come off, get stomped on, and dragged about yeah? The tube is perfect to slip on and off and stuff into the backpack. Yeah, another sock knitter is born! Great yarn you've used. Looks like a fantastic night away! Love the colour of the socks. I think I'm going to have to make a cowl for my son. Looks really good! Sounds like the night away went well - what a beautiful place to stay. Those socks are awesome and to think you can walk AND knit .. boy oh boy that's amazing. I think your little boy is so cute and the neckwarmer is ideal for a young child. Wow, that hotelroom looks perfect! That neckwarmer is so cute, love the cables and the color. Socks are still something I need to learn, but I have other projects that I would love to do first. Your sock looks perfect. Fab sock! They're so much easier than people expect, don't you think? 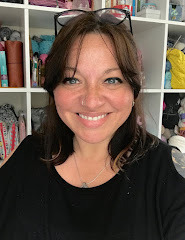 Love the neckwarmer, sounds like a perfect solution for any kid actually, scarves always seem to end up dragging on the floor! He's so cute in his neck warmer. Kids don't do well with scarves, plus there's the whole safety issue of getting the scarf caught in a play item on the playground. The neck warmer is a good solution. Love the color and the pretty cables. The socks looks awesome. It looks so cute on him and I doubt he'll give you a moment to add any inches to it! Thanks Marie, I think you're right! Your boy looks positively cozy with that neckwarmer pulled up over his chin! Good work. Also love the sock. Once you get the hang of it, sock knitting really is easy, isn't it? And there are so many gorgeous sock yarns and sock patterns to play with! A lovely weekend! I a dying for a little get-a-way with the husband as it has been about 4 years since the last time! It has been cold here too, and I am thinking one of those would be delightful for my granddaughter--I just ran over to Ravelry and put your mods in my favorite list!